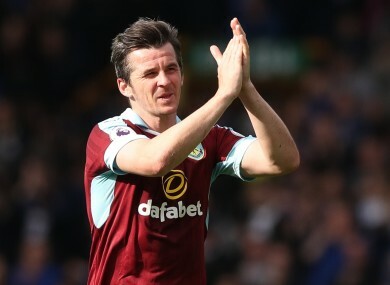 JOEY BARTON BELIEVES his 18-month sentence is harsh as he claims he has a gambling problem and that his betting was down to his addiction and annoyance about being left out of the team on occasion, rather than any attempt at corrupt behaviour. Barton released a fascinating personal statement after the news broke this afternoon which included details on 30 of the bets involving his own team. Some of the statistics around the investigation were particularly interesting. First of all, Barton placed more than 15,000 bets in 15 years, which works out just shy of three bets per day. Something else that is obvious from taking a closer look at Barton’s gambling is how little success he had, especially in the area he should have insight in — the likely success or failure of his own teams. In 30 of Barton’s most pertinent bets for or against the club he was playing for, the combative midfielder won on just three occasions. Across those 30 bets Barton wagered a total of £3682.50, which earned him a return of £488.60. That’s a loss of £3193.90 across bets he had for or against Manchester City, Newcastle United and QPR during his spells at each club. It is also worth pointing out these 30 bets cover 15 matches during Barton’s career, and he is going to publish the information that best illustrates the argument in his statement. Of those 15 matches it is interesting to also note that he was only involved in two games — a 2006 Premier League clash between Manchester City and Fulham, and a 2011 FA Cup tie between Newcastle United and Stevenage — and he backed his team on both occasions. In City’s clash against Fulham 11 years ago Barton put £3 on himself to be the game’s first goalscorer but that honour went to Irish central defender Richard Dunne, Barton’s team-mate. Barton opted to lay £5 on team-mate Georgios Samaras being the first goalscorer and his stake was doubled, as the Greek striker was only introduced as a 66th-minute substitute. Of the 30 bets highlighted in the statement, this one seems to ring the most alarm bells. Barton also bet £600 that Manchester City would win the game against Fulham but they fell to a 2-1 defeat, Collins John levelling matters seven minutes from time before an injury-time strike from Steed Malbranque secured the three points for the Cottagers. It was Fulham’s first win on the road in the 2005/06 season, coming in their penultimate away game of the campaign. In the FA Cup clash against Stevenage, Barton backed Premier League outfit Newcastle to beat their League Two opponents straight up for £497.50, and wagered £250 that the Magpies would be winning the match at half-time and full-time. However, a shock 3-1 defeat, during which Newcastle went 3-0 down before Barton grabbed a consolation, meant the midfielder lost both punts. Barton broke the rules but the aim of his statement was to add context to the situation, and the type of betting he was doing, with the emphasis being on habitual gambling and petulance rather than an attempt to screw the system. By and large, the examples he has provided from the FA’s case back up those claims. Email “Closer look: Joey Barton bet on his own team 30 times and had just three wins”. Feedback on “Closer look: Joey Barton bet on his own team 30 times and had just three wins”.